The use of clove oil to kill mould is something few households question. Like so many Wives Tales however, there is little basis for this assumption. Clove oil like many essential oils (rosemary, cinnamon, tea tree and oregano), have antifungal properties which are used as a defence mechanism by the plant to prevent fungal attack. In a water damaged building however, dumping wads of clove oil will not address the cause of the mould problem or its adverse health effects. Why I hear you ask? Because over 70% of mould spores are dead anyway ie they cannot germinate. Depending upon the type (genre) of fungi and their numbers, these ‘dead’ spores and hyphae fragments may contain mycotoxins which are responsible for the adverse health effects typically found in water damaged buildings. So you see it is irrelevant as to whether you kill the mould (spores) or not, as the focus should be on the cause of mould growth which is moisture. The IICRC S520 standards which is considered to be the international text for mould remediation, recommends that biocides (chemicals which kill fungi) should be avoided in water damaged buildings because they are ineffective and in addition, may expose the user to potentially toxic vapours. 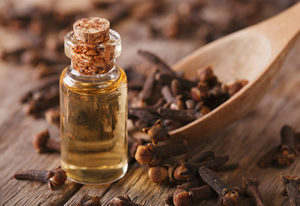 Clove oil is no exception as it contains Eugenol – a constituent that is toxic to the skin, eyes and liver, as well as to the central nervous system leading to dizziness, convulsions, unconsciousness and rapid heartbeat at low doses of 5ml or more. Many people also experience allergic reactions to clove oil. Fungi and their spores are everywhere on earth from the Arctic to the Antarctic, they are nature’s greatest decomposers. Having studied mould remediation both in Australia and abroad, the focus is to address the source of the moisture – excessive condensation, inadequate ventilation, inappropriate drainage, plumbing or roof leaks, flooding, high humidity and so on. Containment may need to occur in situations where there are extensive areas of water damage and this involves sealing the affected area and creating negative air pressure (scrubbers, HEPA filters and dehumidifiers are commonly required) to prevent further contamination of the building. Once this is established, water damaged building materials and furnishings may need to be replaced or remediated, and the mould needs to be removed. How do I remove mould? The best way to deal with mould is to physically remove it. This can be achieved by conducting a HEPA sandwich which involves vacuuming the affected non-porous surface using a vacuum cleaner fitted with a HEPA filter, then wiping with a damp microfibre cloth, and vacuuming again. The microfibre cloth should be soaked in ½ litre of water to which a generous squirt of dishwashing liquid has been added. This procedure will remove the biofilm that microbes in a water-damaged building feed on. The cloths should then be rinsed thoroughly before reusing. At the end of the job, the cloths should be discarded along with the HEPA filter and disposable vacuum cleaner bag. For a detailed discussion on how to remove visible mould from porous (soft furnishings, unsealed timber, rugs…) and non-porous surfaces (hard timber, glass, metal, plastic, concrete…), or a checklist on what your mould remediator should do when remediating your home, buy my book Healthy Home Healthy Family. Microwave oven – friend or foe?